Last year World War Z was being advertised just about anywhere where you could print Brad Pitt’s profile and a pile of corpses. World War Z is a film that fetishizes despair and oozes violence from its every orifice. I don’t know what that says about society, nor do I care to question it – but it sure speaks lengths about how far cinema has come in the last fifty years. Rewind to 1968, and George A. Romero fell into a storm of debate merely for releasing – let alone advertising – his first zombie film, Night of the Living Dead. When a film like World War Z can revel in the excesses of the apocalypse and claim billboards worldwide, it’s easy to forget that Romero’s comparatively tame efforts once faced a cultural climate significantly less appreciative. Romero’s work produced a ‘real terror’ atypical of the genre, and with it, a slew of discussions about the boundaries of the medium. In recent years, ‘transgressive cinema’ has become an unruly beast: a marketing term used to sell Korean horror to the unassuming masses, but here, the label meant something: Night of the Living Dead succeeded in bucking trends and pushing extremes long before extremity was a selling point. A grisly fixation on gore and a black lead character (one that wasn’t a novelty, at that) were rarely seen in cinemas throughout the 60’s, and became the subject of increasingly intense debate as the film picked up steam in the years following its release. It must have come as a surprise to Romero, who has often spoken about how little thought went into Night’s transgressive elements. Despite the film’s prominence in racial studies in particular (owing to some striking racial imagery), Romero has always deferred credit, instead insisting that Duane Jones – the film’s black lead – was picked only because he was the best fit for the part – going so far as to say that he ‘resisted writing new dialogue cause he happened to be black’. For Romero and his crew, Night of the Living Dead was inherently personal ‘rather than any sort of calculated political statement’, and it’s the awkward dichotomy between Romero’s personal vision and the film’s cultural appropriation that has fuelled discussion for half a century. True enough to a world in which the malevolent dead rise, Night of the Living Dead initially appears senseless; from its violence to its bleak tone; it’s transgressive elements left as a blank slate for critics, whether they’re concerned with race, gender, or even gang culture. It’s not surprising that Night has become such a cherished piece in popular film studies. 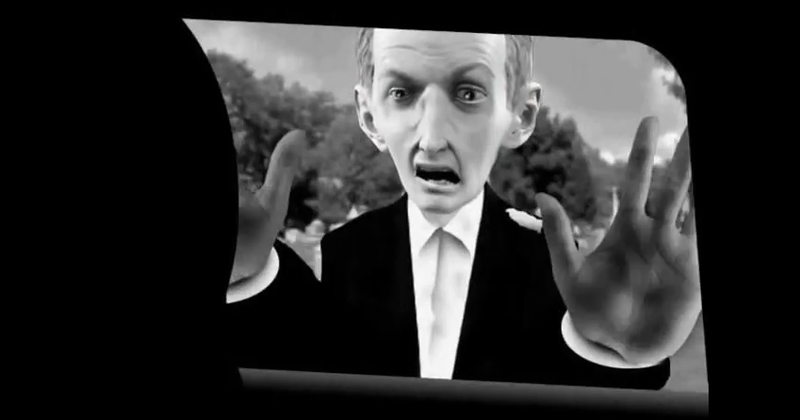 Which leads us into 2009’s Night of the Living Dead: Reanimated, the product of one hundred animators’ efforts to completely overhaul Night’s visuals, mixing a jumbled collage of styles into a ninety minute love letter to Romero’s original work. In a time where 28 Days Later and World War Z exist in all their gory glory, it’s often hard to associate the cultural artefact ‘Night of the Living Dead’ with the content of the film itself, and Reanimated attempts to reconcile the two – allowing its viewer to witness, first-hand, the wonders of interpretation that have surrounded the film for half a century. 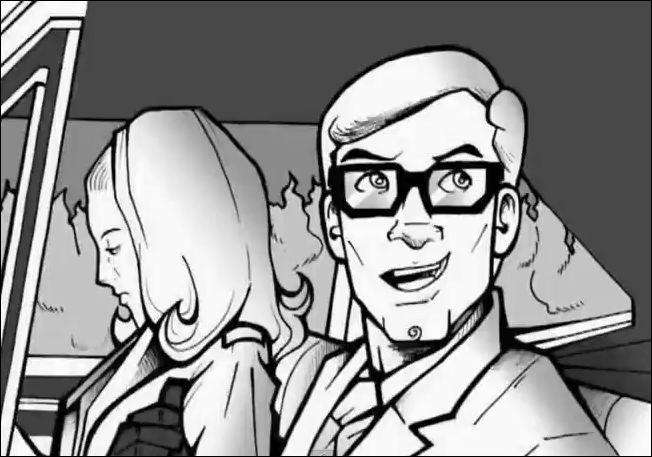 Conceptually, Reanimated scratches a certain itch, even if you don’t share a love for Romero’s original. Like the Liquid TV of MTV’s younger days, it promises to showcase the works of amateur animators, eclectically mixed and compiled – in this case by project leader Mike Schneider – and thrown, scattershot, into the wild. Admittedly, the cheap, unrated packaging never betrays the film’s low-rent offerings; but Reanimated often sinks into some objectively bad stuff. Spoiled by the output of the internet’s best animators, and fuelled by a devout love of Romero’s work, I had expected an easy-going, fluid take on the original. What I got was something else altogether. The quality of the work within varies wildly, from fully-animated vignettes to still-frame offerings drawn from the darkest depths of MS paint; and it creates an experience best described as messy. Although Mike Schneider’s editing keeps everything in sync and coherent, the mesh of conflicting styles proves severe; while more interpretive offerings can be over-reliant on your knowledge of the original work. Needless to say, it may not make for the most streamlined viewing experience, but – and here’s the kicker – I’m happy to say that it all works towards something of a larger purpose. Once you’ve acclimated to the jarring presentation and witnessed some of the shakier offerings on display, Reanimated becomes nothing less than a testament to the influence of Romero’s work. Artists from all walks of life and skill-levels are represented; from polished, hyper-sexualised, pulp-comic artists to admirably low-rent stick animators, and it ultimately presents a heart-warming slice of a viewership indebted in some small way to a film approaching its 50th anniversary. Although it may enthrall and appall in equal measure, there’s something to it. Take a step back and Reanimated can be appreciated independent of Night of the Living Dead as a film about the reading and interpretation of art. 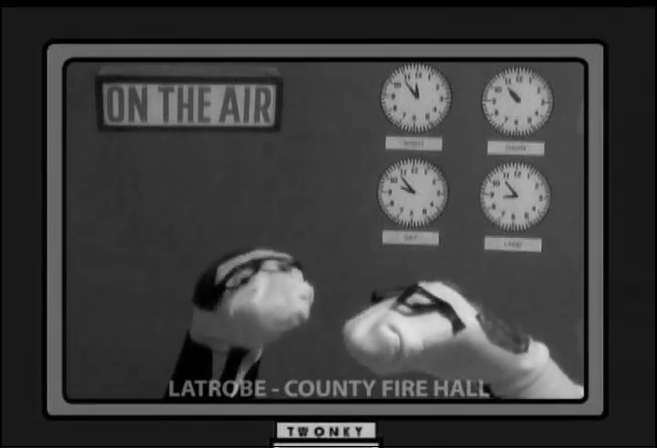 Even when Night’s news anchors are replaced by sock puppets, a scene clearly played for laughs, you can question the differences in representation between the two works, to consider just how movies are, have been, and can be, read. 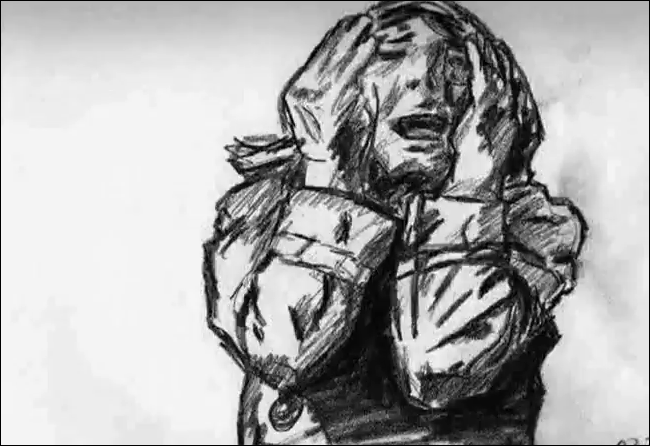 Some of Reanimated’s defining shots, such as a prolonged sequence involving Barbie dolls, or Scottish animator Calum MacAskill’s turn conveying the action through impressionistic shapes, speak to those specific artist’s viewings of a film – to a mood or a sense of place uncommon from viewer to viewer. Presented in such a raw style, it makes for an interesting watch. It’s these viewings that are the crux of Reanimated. For many, Night’s Barbara (of ‘I’m coming to get you’ fame) is a passive symbol of repression and mocked as such; whereas to others she’s no less than a strong female presence unfortunately ruined by the death of those around her. In Reanimated’s art, whether realistic, painterly or outright absurd, we can tap into these readings, and view Night from a hundred different perspectives within the space of ninety minutes. In many ways, this was the perfect film for it. Faceless though they may be, zombies are fundamentally human, and it’s this aspect that leaves zombie films ripe for social commentary – doubly so in the case of Night, which – as noted – straddled the line between cultural transgression and personal expression. Like a Rorschach test, it responds to every viewer differently, something which is repeatedly proven throughout Reanimated. Yes, it’s a mess, but there’s something knowingly great on display here. Reanimated is a reflexive meditation on the consumption of film and art, one engaged with Romero’s work in novel ways. In many respects, it’s a visual representation of the cultural journey that has led us to bus-stop adverts for World War Z.
I tip my hat to a particular John Kricfalusi-inspired lampooning of the survivor’s cartoonish hopelessness at the film’s mid-way point, if just for making me laugh, especially in light of half a century’s worth of zombie flicks – but more importantly, I offer my respect to everyone involved with the project, for encouraging me to think once more about a film I know and love, and for proving that others do, too. Ultimately, it’s not an easy watch, but you get back as much as you put in. I’m glad that it exists, and – at the very least – you should be too. This entry was posted in Films and tagged Animation, film, George A. Romero, Night of the Living Dead, Night of the Living Dead Reanimated, review, Zombies. Bookmark the permalink.